The Smoking Gun brings us a story of young caregivers at a Minnesota Nursing home mistreating the residents. Criminal charges have been brought against the two who are over age 18 for abuse including physical torment and sexual contact. I had seen but passed over this story as too disgusting to present on the blog. The thought of the elderly being unsafe in a place which is designed to protect them is disturbing. But another story brought it back to my mind. 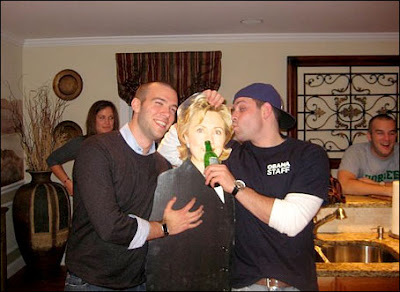 It seems that 27 year old Jon Favreau had some pictures taken of himself and an associate playing with a cutout of sixty-something Hillary Clinton. The friend is offering the Hillary cutout a beer, and Favreau is striking a pose of groping her breast. This and other pics were placed on Favreau's facebook site, but were removed after about two hours. One wonders why a guy, in a position as Obama's chief speechwriter would post such pics of himself. It could be that he completely lacks a sense that some people could find the behavior a bit odd or disgusting. There are certain types of people from whom I would expect all sorts of unusual behavior, but it's rare for even those people to "do it in the road" displaying it for all to see. Yep.... this is Obama's chief speechwriter, ... the guy who conveys in words, the lofty ideals and virtue of the next president..... as he would have others see him.